An Iranian Christian agency is speaking out against a prominent bishop who recently claimed that Christians in the Islamic Republic "enjoy complete freedom." As Mohabat News reported Monday, Bishop Sibo Sarkisian, Armenian-Orthodox Bishop of Tehran, said in a recent interview with Spanish news agency EFE that not only do followers of Jesus Christ have freedom of religion, but that they are "not being persecuted in any way." "We have freedom of religion in Iran and the Islamic government grants its Christian citizens every right to practice their faith, including observing their feasts such as Christmas. They're just not allowed to share their faith publicly as it is forbidden under the Islamic government's law," Sarkisian added. The bishop declared he does not approve of the "idea of evangelism." "Each individual should adhere to their own religious, national and ethnic identity," he stated. Mohabat News, which says it is the news agency of Iranian Christians and is a group of "Bible-believing Christians who believe in propagating the word of God," took issue with those claims, however. The news agency pointed out that evangelism is not just an "idea," but part of the biblical mandate given to all Christians around the world, regardless of what denomination they are part of. It added that millions of believers, as well as many of those who are growing in numbers in Iran, view evangelism as an essential part of faith, and that the restrictions against it negates the claim that they have "complete freedom" in Iran. Mohabat News further positioned that the Islamic government celebrates non-Muslim conversions to Islam. "In such cases, the Islamic regime publicly announces the person's conversion and portrays it as 'triumph of Islam over infidelity,'" it pointed out. There have been a number of reports this past year of Iranian authorities targeting Christian converts with arrest and imprisonment. The New York-based Center for Human Rights In Iran reported last year that since June 2017, the evolutionary Court in Tehran has issued long prison sentences to at least 11 Christian converts and counting. "Christians are recognized as an official religious minority in Iran's Constitution, but the state continues to persecute members of the faith, especially converts," said CHRI's executive director Hadi Ghaemi. "The state must respect its own laws and international obligations and allow Christians and all religious minorities full freedom of worship." 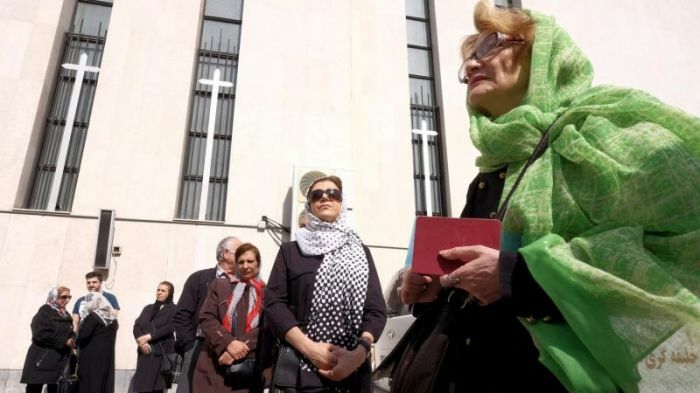 Several persecution watchdog groups have listed Iran as one of the worst countries for religious freedom, for Christians and others religious minorities. Open Doors USA ranked Iran as the eighth worst country when it comes to the persecution of Christians in its 2017 World Watch List, while in August the U.S. Commission on International Religious Freedom listed it among the top five worst-scoring countries on blasphemy laws made to protect Islam. Protestant Christian communities that evangelize to Muslims were found to be one of the most persecuted groups in the Islamic nation. In October, the All-Party Parliamentary Group for International Freedom of Religion or Belief highlighted that Baha'is, a minority religion that combines elements of Christianity, Islam, and other world religions, experience some of the worst persecution in the world in Iran.